We found Boo with an umbilical cord still attached. We bottle fed him around the clock for three months. His adopted mom taught him how to go to the bathroom, how to eat, and how to love. I will always remember whistling for him when it was time to go to bed, and he would follow me back to the bedroom. He loved sleeping on his robe, and attacking anyone who would walk by his room. "Dr. Carly was so helpful and compassionate. She really helped through the entire process." "Dr. Carly was with us during the lowest moment of our lives. Her understanding, support and kindness is truly a gift. She made the transition for us and Clowey extremely peaceful and for that we are eternally grateful. From the bottom of our hearts...thank you Dr. Carly." 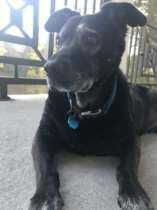 Shadow (black lab mix) was born 06/04/2006. When I arrived at the breeder's home, she ran to me, messed up tail and all. I then found out that she was the only one left and no one wanted her. Throughout her life, she had the best disposition. Even though my neighbor ran over her and she had to have hip surgery, was bitten by a snake and sliced open by a piece of metal as she was trying to go through a fence, she was a thoroughbred through and through. She loved playing yellow ball and swimming in the pond. She also loved to ride in the golf cart. She had a growth in her throat, we had it removed and it grew back. Her airway was the size of a dime and her breathing was taxing on her body. Shadow loved to swim in the pond too. Dr. Carly with Lap of Love was amazing. I'll never forget the time and care she gave us, Sammie Girl and Shadow. I appreciated her checking them out prior to their passing by validating that we were doing the right thing. She saw that Shadow could not go on any longer in pain. His hips were deteriorated and it was painful for him to move around. Sometimes he would just lay there and not eat. 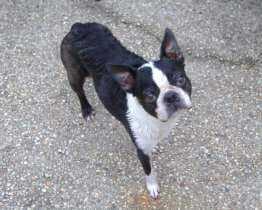 Sammie Girl's growth in her throat had expanded upward behind her eye. The pressure on her eye had to be so painful. It was with all of these situations that Shawn and I were forced to make two of the hardest decisions ever. Lady Samantha La Mocha Rayburn was the AKC name we gave her. We started out with SAM (Shawn Ashley Melissa) then expanded on a name fitting for her. Shadow was my nephews' dog that we initially were taking care of but eventually he never left and they became best friends. Shadow was very protective of Sammie Girl. "She was amazing and made the transition as bearable as it could possibly have been." 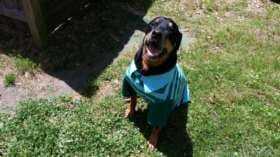 7/4/2005 - 10/28/2018Today we said goodbye to our loyal pup VooDoo. I remember well the day we brought you home from the shelter. We could not have picked a more loyal protector for our family. Of course, you were the alpha ~ our boat riding, fishing loving, smoking meat on lazy day companion. Many tears shed today, but I know you are in a better place, in no pain and surrounded by big bones in Heaven. Our family would like to thank Dr. Carly for comforting us during this time. Its never easy, but she has been a blessing! 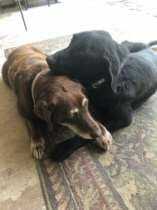 VooDoo, our 1/2 lab 1/2 pit, was adopted from the Denham Springs Animal Shelter in 2005 right after Hurricane Katrina. Two months later we adopted his sister, Jinxy, also a pit. They were the best of friends growing up. In the early years they enjoyed trips to our camp, chasing squirrels, swimming, barking at the waves and of course dad's excellent smoked meats. After the flood of 2016 we decided to build a house on the river and we knew our old man VooDoo probably would not make it to see our new home. He was aging quickly and cancer was starting to take a toll. So hard to watch when you know his mind is still healthy but his body was not. Much to the surprise of our family, and vet, he made the move to the river house. We often joked that he was one expensive dog due to the fact that we put an elevator in the house to get him up and down. Four months ago we adopted Brisket, another pit. Voodoo loving taught him how to navigate his new surroundings, house trained him and at times would play with him. Once again, we were shocked that he adapted so well. There will never be another VooDoo ~ Dad, Mom, Chelsea, Hayden, Brandon, Jinxy, and Brisket (a/k/a TanMan) will miss you! "Our family would like to thank Dr. Carly for comforting us during this time. It's never easy, but she has been a blessing! Such a calming soul with a big heart! Words cannot express our recommendation. "Dr Carly was so compassionate, gentle and professional. I am forever grateful to her for the gift of having the family gathered in our living room when Snowball passed in my arms." When he was still a pup Griffin's owner left him behind to go to college. Her father didn't want him and was going to put him in the pound. I took him instead. The first thing he did when I got him home was pee in the bedroom! He was so damn cute though. I couldn't be mad. We got him settled in and he grew up to be nothing short of amazing! His responses to complex commands were phenomenal, and he seemed to truly love learning. I've never had a dog that could communicate with me so well. People have told me that Griffin was lucky I found him, and that I saved him, but it was certainly the other way around. "Carly is a wonderful person! She was warm and caring throughout the process. She has an extremely difficult job that she performs with kind thoughtfulness. I am so grateful to her, and Lap of Love for making it possible to do such a difficult thing in the comfort of my own home." 7/5/2002 - 2/20/2018Chloe Sue, you were our best friend for 15 1/2 years. When we rescued you from the pound, we were 5 years old and 2 years old. You were just 2 months old. We went through a lot together. You were the sweetest and most loving dog we could have ever asked for. You were energetic , yet lazy, never failing to bring laughter to our lives and smiles to our faces. We will never forget your ability to scale the fence in a single bound, nor the way you would jump and bounce around the backyard like a gazelle to chase the lightning and thunder. You were gentle and loving to all of us, especially Sadie Mae and Jake. And let's not forget how you took Bear in. He will miss you terribly!!! You will hold a special place in our hearts always. As difficult as it was to say good-bye, we know you are in pain no more, and reunited with Jake, Sadie Mae, and Grandpa. We love you Chloe Sue, and we will meet you again at the bridge one day. "Once again, our family would like to express our deepest gratitude and heartfelt appreciation to Dr. Carly. Her professionalism, tenderness, and compassion towards our beloved pets and to our family is appreciated more than she will know. During such difficult times, she has been peace, comfort, and hope. Not only was our beloved Chloe treated with dignity, Dr. Carly was thoughtful and caring to our daughters, Meghan and Hannah, and to our remaining furry son, Bear. Thank you, Dr. Carly, for your kindness and compassion." 8/6/1997 - 2/6/2018Miss Boo was a tiny 5 day old kitten thrown out with someone's trash. We brought her in and gave her a good home full of love and LOTS of attention! Miss Boo was a little spit fire who at the same time could be loving and gentle. She was obviously a runt having a bobbed tail and only 3 toes on her back left paw. She watched the house on days I would be gone. The queen of the castle as she would sit on her velvet covered bed complete with a heating pad! Almost 21 years later we had to say goodbye to my precious love who always would give "love bites" in return. Thank you for taking care of me all these years and filling the void of loneliness when I needed it most. We Love you Miss Boo. up 1 hour after i called. Sweet, kind and very professional. "Waiting from 11 am to 3 yesterday for Dr. Carly was like waiting for a grim reaper. My husband said "She's here", the words i dreaded. But there at my door was a sweet face young woman with a soft voice, she carried a little doctors bag like in earlier times. She quiety sat by my sleeping Nicholous. She spoke in quiet tones, she knew our anglish. With her help, he died on his warm sleeping pad with my husband petting him. If anything other than this would have happened, I would never forgive myself for keeping him alive until something bad happened."